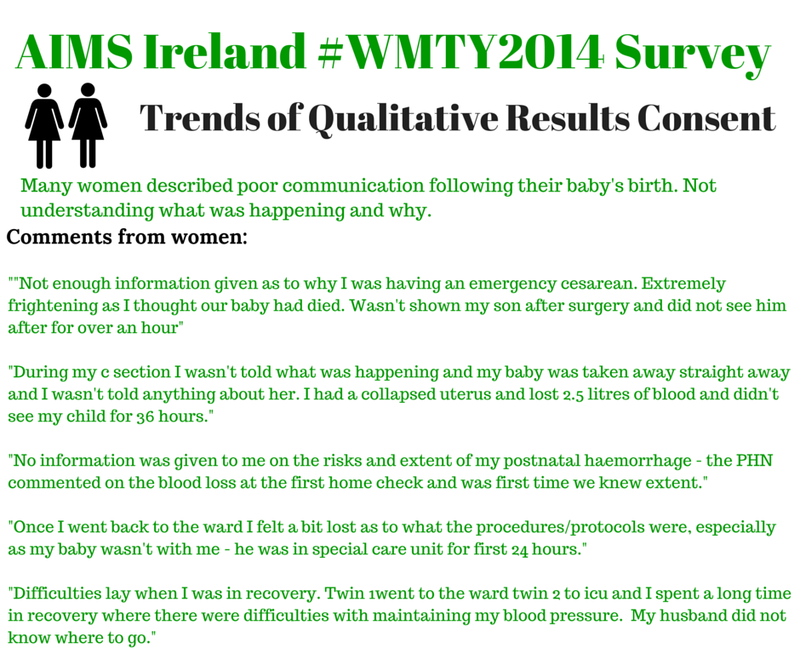 “What Matters to YOU?” 2014 Report on Consent in the Irish Maternity System. 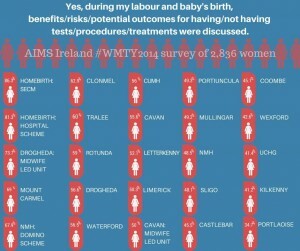 AIMS Ireland (Association for Improvements in the Maternity Services Ireland) is a voluntary organisation with charity status which was formed in 2007 by women who saw a need for a consumer driven organisation to support a woman’s human rights and her choices in childbirth, highlight healthy internationally recognised evidence based birth practices, and to provide support and information to women accessing maternity services in Ireland. It is a consumer led, campaign pressure group operating with a self-regulating committee elect and a body of members consisting of parents, consumers, health care professionals, and support group representatives throughout Ireland. 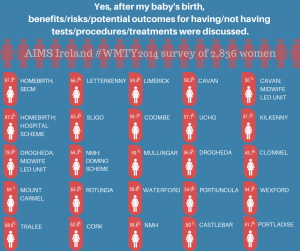 AIMS Ireland was set up with the support of The Association for Improvements in the Maternity Services UK. AIMS UK has been at the forefront of improving maternity services the past 40 years. 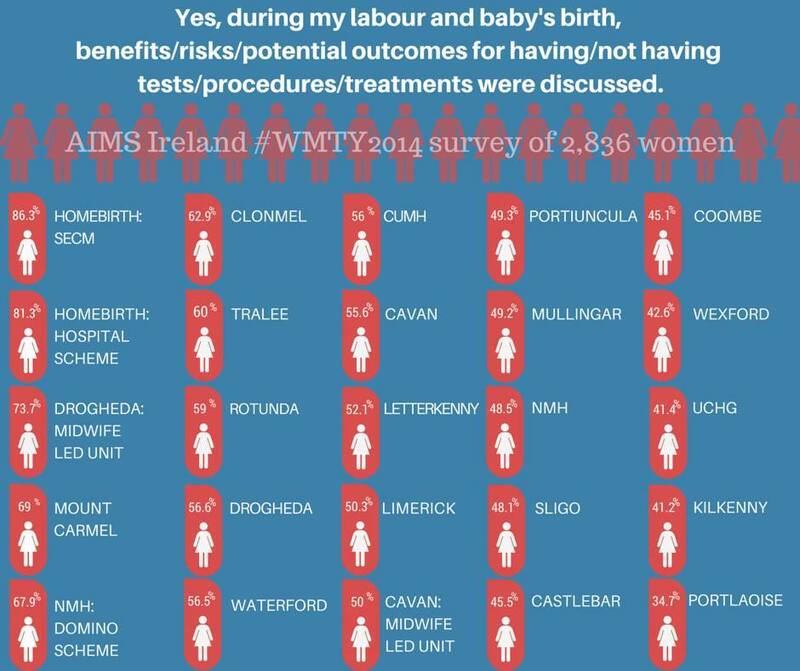 An independent analysis was compiled by statistical analyst Laura Conlon, whom is otherwise not involved with AIMS Ireland or maternity/birth related activism or business. 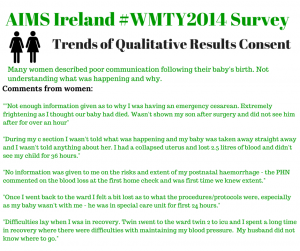 Due to the vast content and information obtained through the WMTY survey, AIMS Ireland will be releasing data over the next few months. 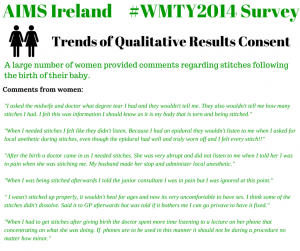 The first data to be release looked at women’s experiences of consent in Irish Maternity Services; reported here. The second wave of results, a comprehensive look at care options and experiences, will be released on March 14, 2015 at the AIMS Ireland AGM. This report looks at 2014 results relating to questions specific to consent, informed consent, and informed refusal in pregnancy, labour and birth, and during the postnatal period. These questions were designed to obtain current information on women’s experiences of consent in the maternity services. 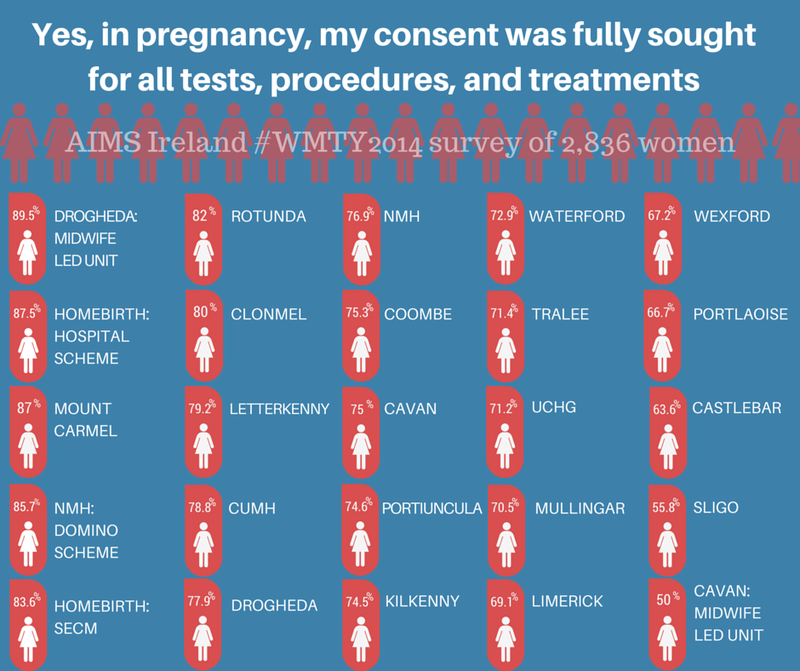 This is the second time AIMS Ireland has investigated consent, with a previous AIMS Ireland survey, “The availability of Information and Consent”, in which 161 respondents participated (2007). 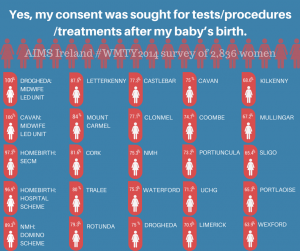 AIMS Ireland were interested to re-examine the issue of consent, informed consent, and informed refusal in the 2014 survey with women whom have birthed in Ireland in the past 5 years to see if any notable changes have occurred in this area. We also hoped to reach a larger cohort of women. 3) informed refusal – were women given the opportunity to decline a test, procedure, or treatment. 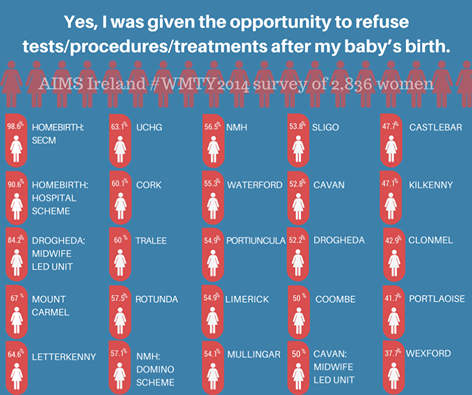 1) Many women report to AIMS Ireland that they are supported in making an informed decision to have a procedure, test, or treatment, but they are not supported in declining tests, procedures, treatments – informed refusal. 2) The Irish National Consent Policy, citing the Irish Constitution (40.3.3), questions the rights of a pregnant woman to make an informed refusal; decline a medical procedure outside of recommendations by medical professionals. 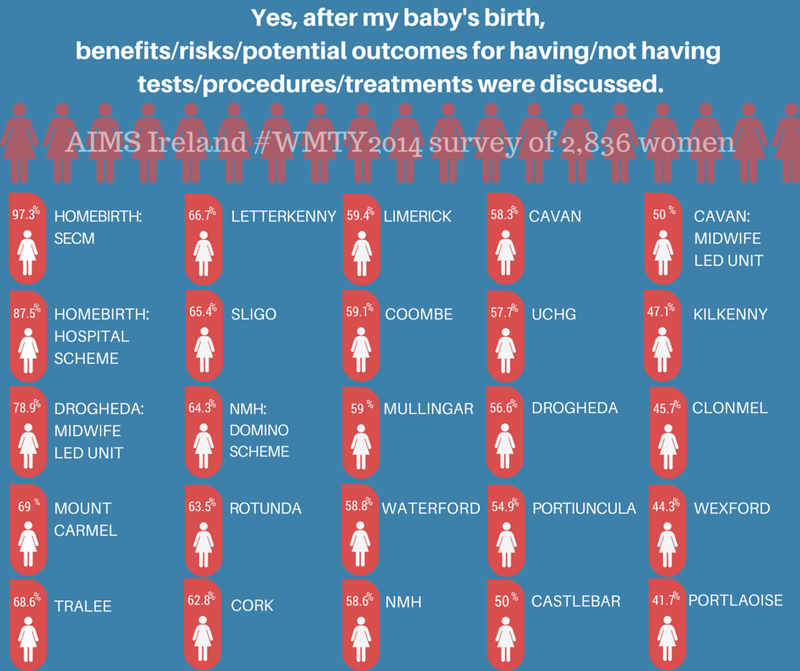 AIMS Ireland asked respondents if consent was fully sought for all tests, procedures, and treatments in their pregnancy (ante-natal clinics, booking, etc), during their labour and baby’s birth, and during the post-natal period (following the birth of the baby). 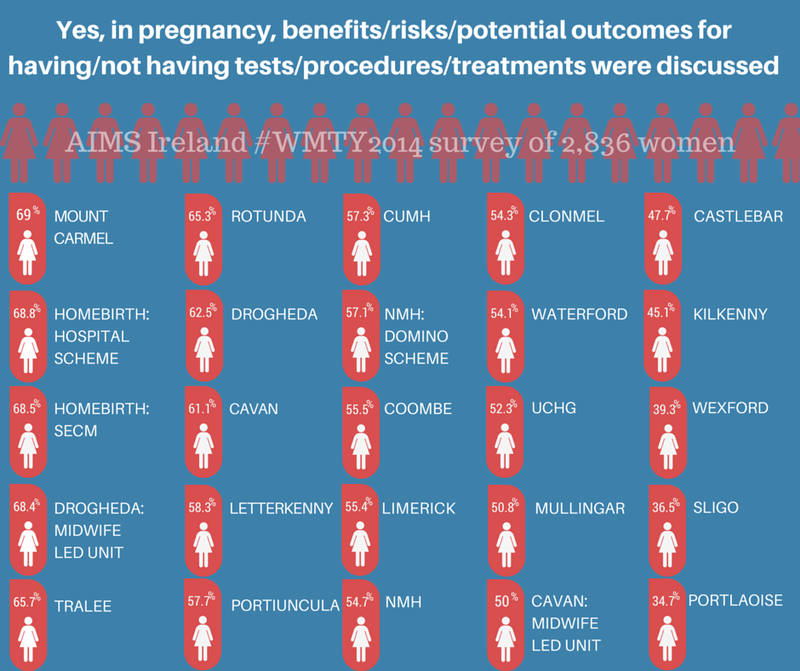 We also asked if women were provided with informed consent, provided with benefits, risks, potential outcomes for themselves and/or their baby to have or not have a test, procedure, treatment in pregnancy, labour/birth, postnatal period. And finally, if women had the opportunity to make an informed refusal. 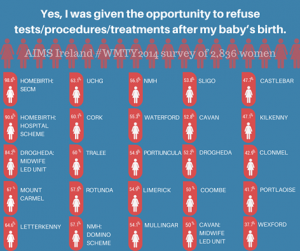 The results are reported for ‘overall’ figures for the 2,836 respondents and then were broken down by care options in Ireland; Each of Ireland’s 19 obstetric led units, 1 private obstetric led unit (now closed), midwife led care options in Ireland, unassisted homebirth, and born before arrival (BBA). There was significant representation of all the obstetric led units in Ireland and most other care options. However, some care options had limited responses which have implications on results. Infograph #2 Basic Consent Results in pregnancy by care option. 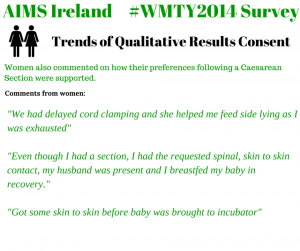 *note that for Cavan Midwife-Led Unit there were only two survey respondents. Infograph #3 Informed Consent in pregnancy results by care option. Infograph #4 Informed refusal in pregnancy results by care option. 8. Trends in Qualitative Data. 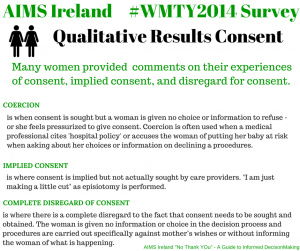 The AIMS Ireland committee reviewed qualitative data for questions relating to consent and found that re-occuring trends appeared from the respondents who provided comments on the topic of consent. 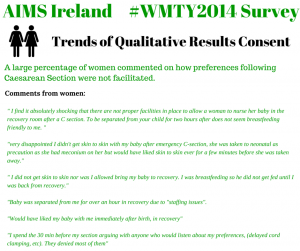 Basic consent issues, lack of choice regarding care options / routine tests, procedures, “not being listened to”, birthing described as “traumatic”, and feelings of having no control or choice were the most common phrases used by women in this section. There were comments highlighting positive care, “being listened to” and “having control” being the key phrases used by women who described their care as positive. Other women felt that consent was not relevant in their experience for a variety of reasons ranging from trust in medical professional’s recommendations, emergency situations, they felt no tests/procedures/treatments were initiated or suggested in their care, and the place or conditions of their birth (very fast, born without medical professional in attendance/born before arrival/homebirth). Qualitative data mirrored quantitative statistics as many women felt that while consent was sought, suggesting an overall high rate for basic consent, they felt this was a ‘box ticking’ exercise and they did not really have a choice. Three main areas were identified from women’s comments; coercion, implied consent, and a complete disregard for consent. 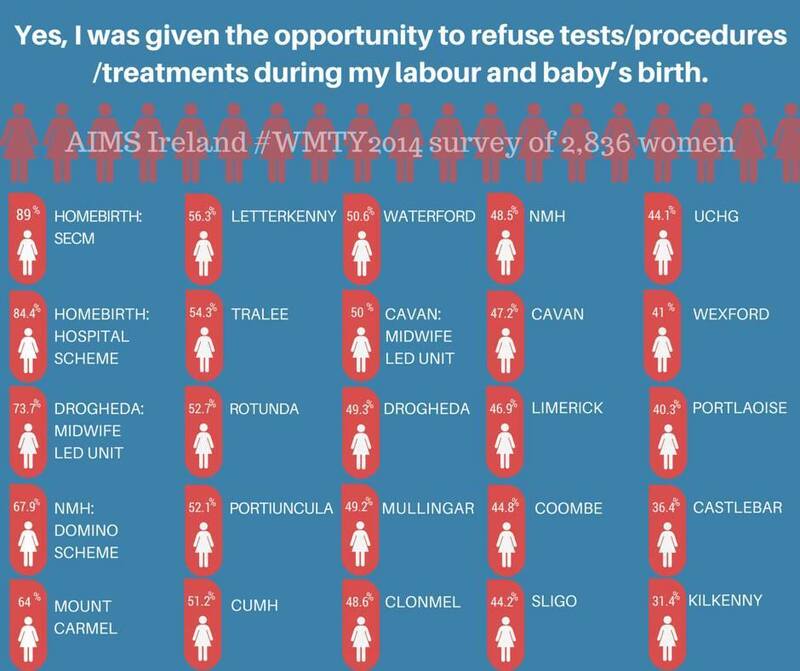 1) Many women left comments with regards to the disregard for informed choice on care options / place of birth in Ireland; HSE exclusion criteria for Midwife Led Units (MLU), waterbirth, and homebirth. 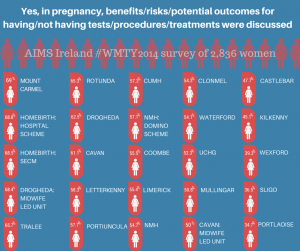 2) A few women commented on how they felt pressured into tests, procedures, treatments (particularly GTT) in pregnancy in order to avail of their choice of care option. 3) Many women commented on a lack of information to assist them to make an informed decison / informed refusal. 4) Women commented that in pregnancy there was a perception of assumed consent from care providers with routine tests/procedures/treatments in accessing ante-ntal care. “In the hospital and with the doctor unless I refused the procedure it was assumed that I would go ahead with it. I was told that it was happening, not asked if I wanted it to happen. 5) Several women commented that they did not understand why recommendations would be declined. 6) Many women left comments describing expressions of guilt or being lied to regarding informed consent / informed refusal in pregnancy. 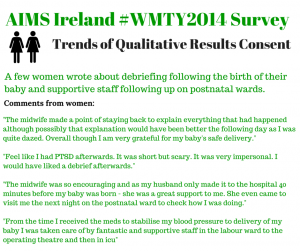 7) Women commented on how the format of the Irish maternity system, or logistics (under-staffing) affected informed consent / informed refusal. 8) Women commented with examples of feeling ‘bullied’ into consent for tests/procedures/treatments in pregnancy or provided examples of disregard of consent. 9) Women commented on self-advocacy and provided examples in which they were supported in informed consent / informed refusal in pregnancy; though sometimes describing this as a ‘fight’ for some women in some instances. Trend #1: Many women responded that while consent was sought, they often felt they did not have a choice. 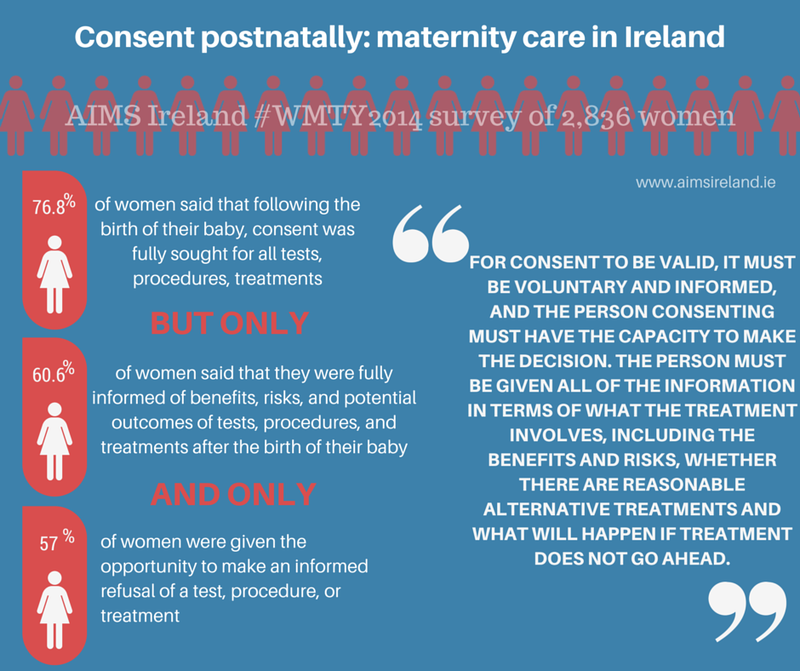 Trend #2: AIMS Ireland also found that many women were cited with ‘hospital policy’ and/or risk to their baby in order to obtain consent. Trend #5: Others described very supportive care where care providers went out of their way to ensure that women were informed and decisions were supported. Trend #6: Other women felt that consent was not applicable to them, did not arise, or that they trusted health care providers in their recommendations. Trend #7: Others were able to make an informed decision but described this as being difficult ‘a fight’ or being down to experience. 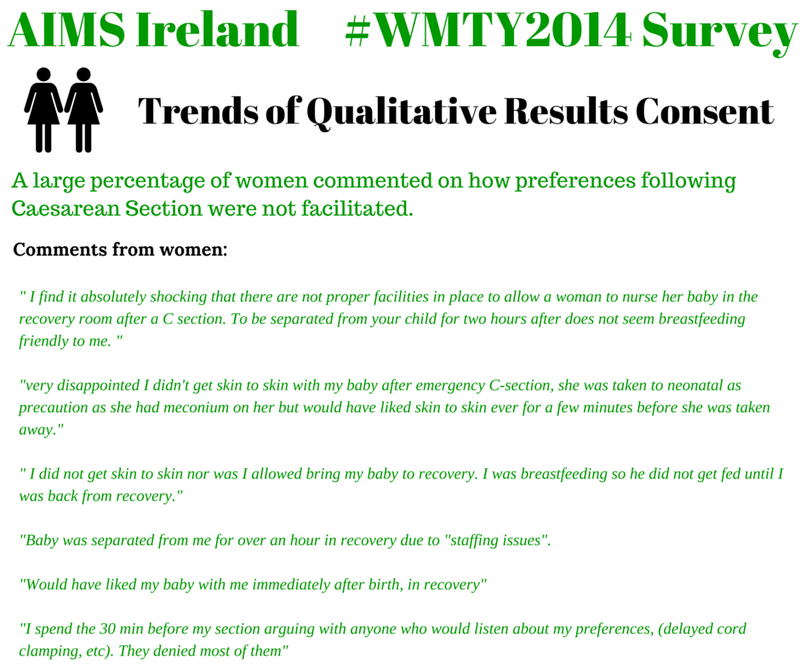 1) There was a very large response from women who commented on how their preferences following Caesarean Section were not facilitated. 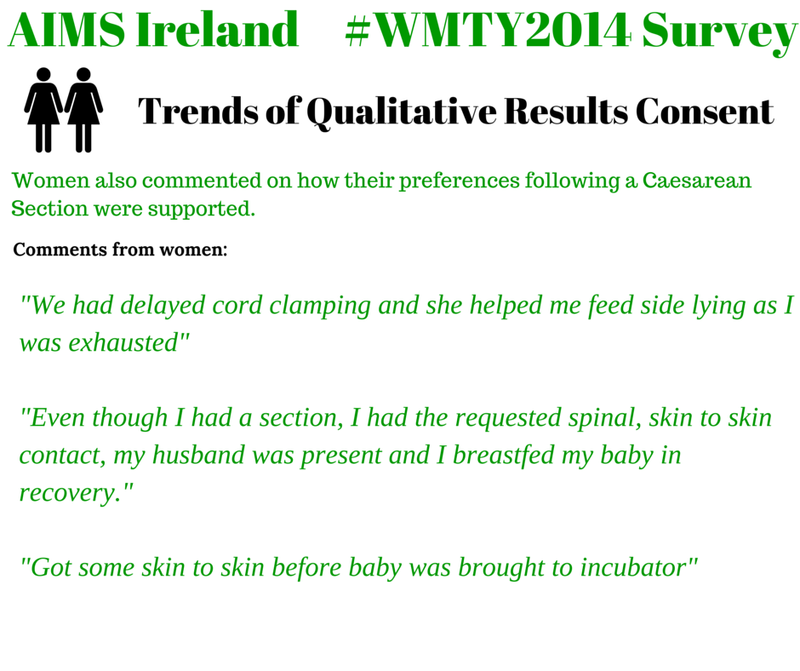 2) Some women commented on how their preferences following a Caesarean Section were supported. 3) Many women commented on a lack of informed choice and a disregard for consent with issues relating to feeding their baby. 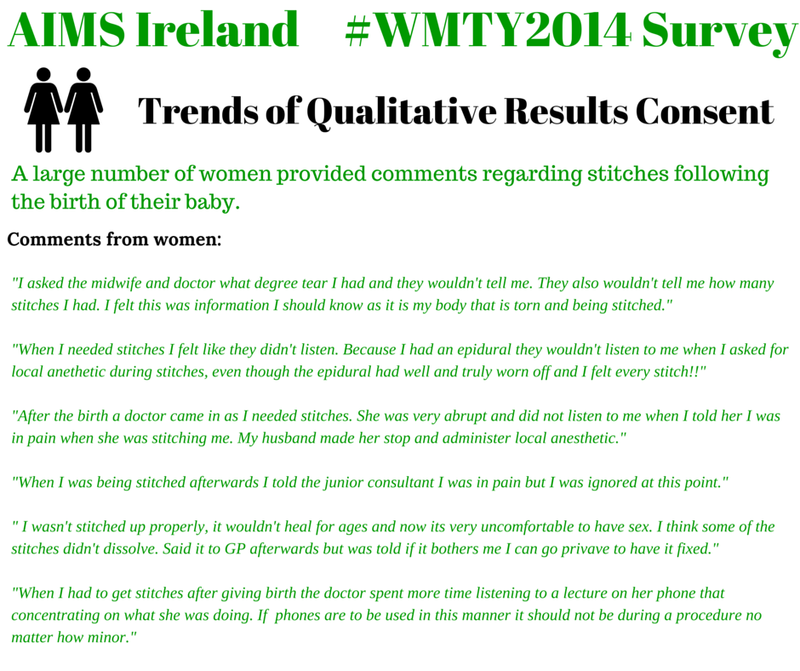 4) A large number of women provided comments regarding stitches following the birth of their baby. Trigger warning, some comments may be distressing for some readers. 5) Many women described poor communication following the birth of their baby. Not understanding what was happening or why. 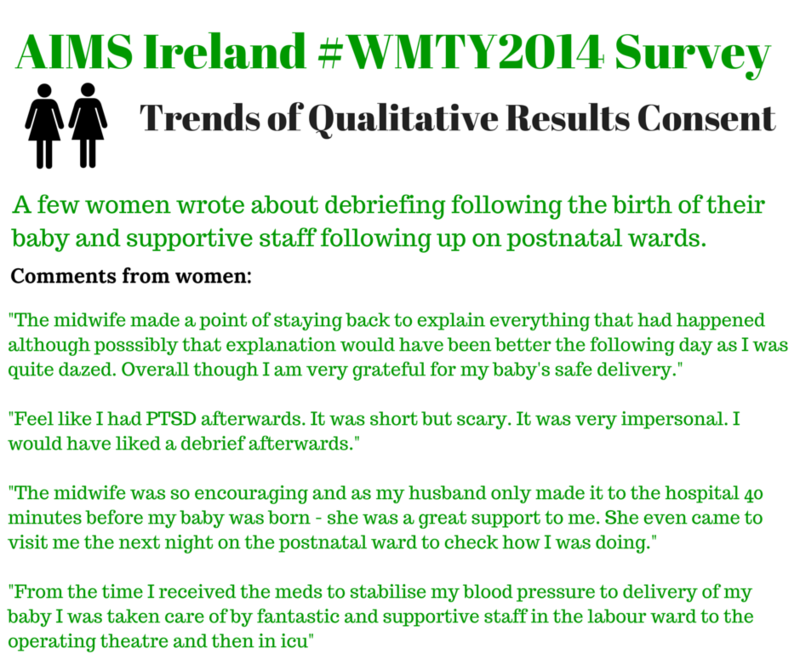 6) A few women wrote about debriefing following the birth of their baby and supportive staff following up on postnatal wards. Numerous women discussed busy and understaffed labour, birth, and postnatal wards which affected their care. 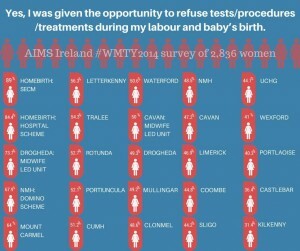 The findings of nearly 3,000 women, whom had given birth in Ireland in the past 5 years (2010-2014), found that while 67% of women agreed that basic consent had been sought during labour and birth, 52% of those surveyed did not receive information on potential implications to have or not have tests, procedures, treatments to assist with their decisions, and only 50% felt able to make an informed refusal during their labour and baby’s birth. 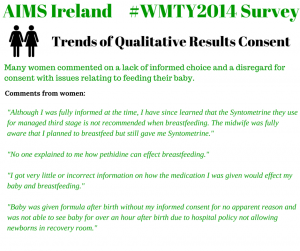 These trends were mirrored in results in pregnancy and during the postnatal period. 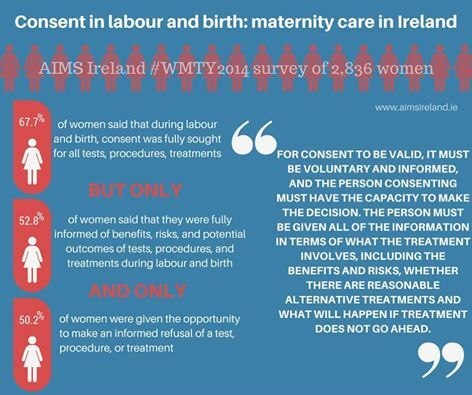 Further, results of consent practices in the various care options available in Ireland suggest that care models (medical/obsetric vs physiological/midwife led), ‘where’ and ‘with whom’ a woman accesses maternity care had an influence on her likelihood of informed decision making. 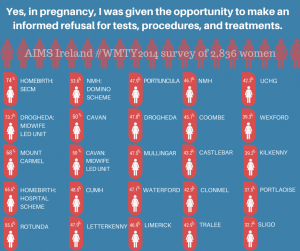 With rates ranging from 86.3% to 34.7% for informed consent in labour and birth and 89% to 31.4% for rates of informed refusal during labour and birth. While the overall rates for basic consent appear high, the quantitative statistics suggest that informed consent and refusal remain an issue of concern with only 50% of women being provided with the necessary information to assist them in informed decision making. 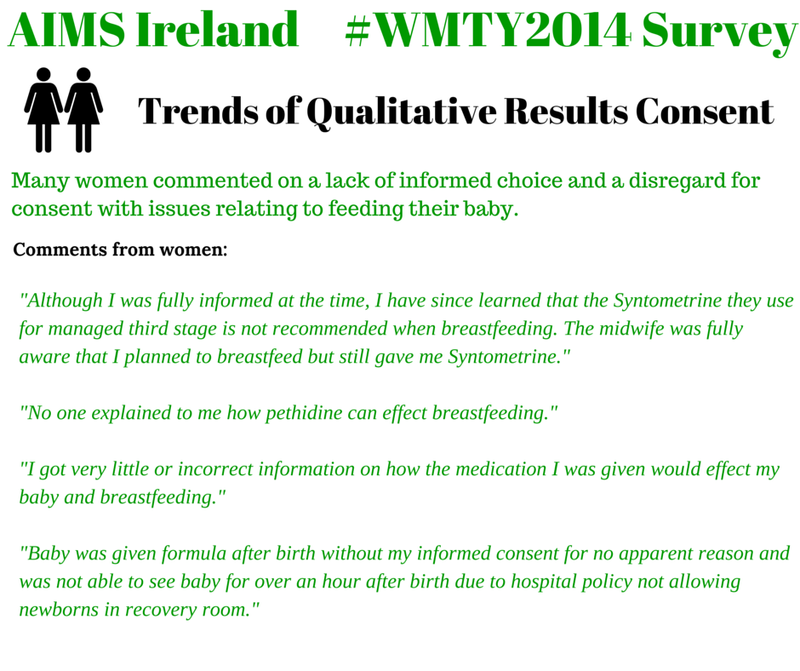 The qualitative data, comments from women, provide us with very worrying information as many women commented that consent was either implied as the procedure was being carried out “we are just going to break your waters now” as rupture of membranes was being performed, coerced by hospital policy or perceived risk to baby, influenced by care providers opinion not based on evidence, were not provided with information necessary to make decisions for themselves and their baby, or women felt that while they consented, they did not have any choice in doing so. Positive comments from women showed that a supportive care provider is very important in women’s overall experiences and likelihood of informed decision making. In instances where complications arose and it was medically necessary for the woman’s care to deviate from her preferences, being informed and included in decision making and being “listened to” gave women a sense of control and a more positive experience. 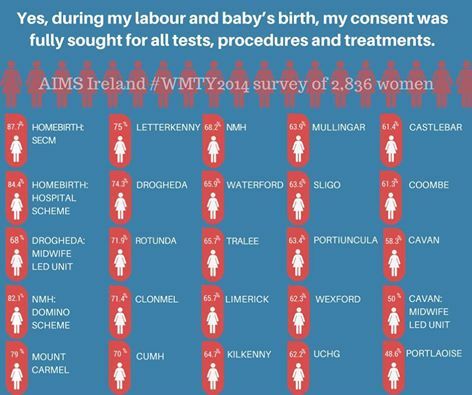 The survey also showed that consent and informed consent/refusal were higher for procedures, tests, treatments in pregnancy and the postpartum period (following the birth of the baby) than during the labour and birth, which AIMS Ireland contribute to underlying issues in Ireland’s National Consent Policy. 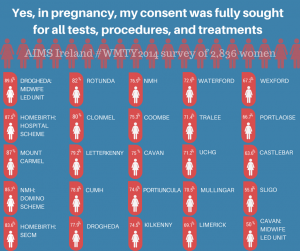 The Irish National Consent Policy directly questions a pregnant woman’s right to refuse treatment. This has a serious implication on a woman’s right to make informed decisions outside of clinical recommendation in Ireland. 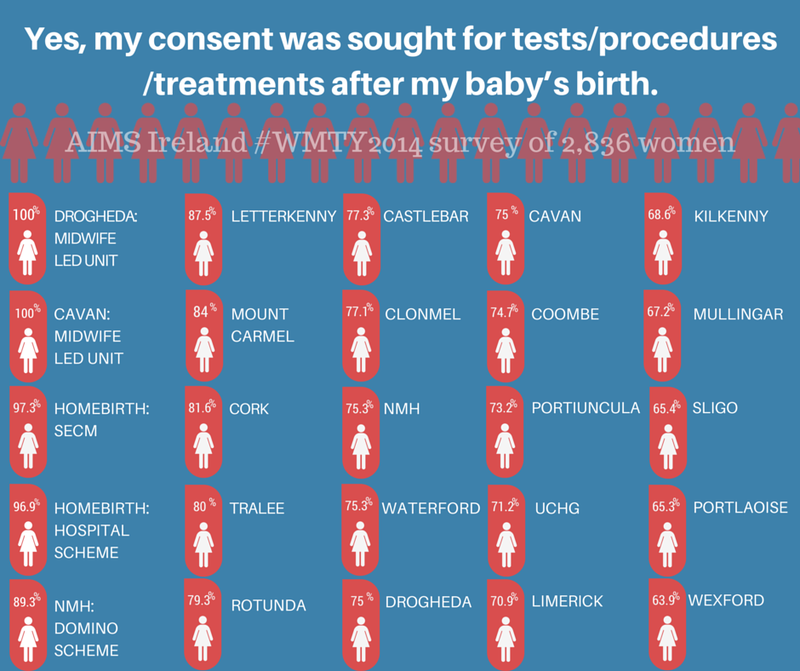 The drop in rates of consent and informed consent/refusal during the time of labour and birth suggests that this policy is very much reflected in practice within Irish maternity units. Many women commented on staff shortages of midwives to look after them in labour, birth, and following the birth of their baby; providing examples of the implications of shortages on their experience and care. 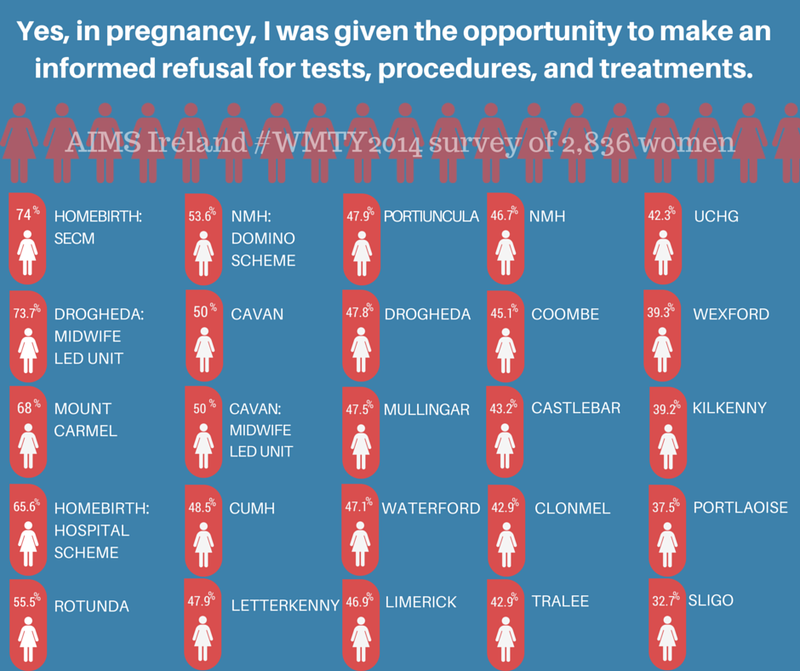 AIMS Ireland have raised the issue of midwife : woman ratios in Ireland previously, with many units falling far outside recommendations. 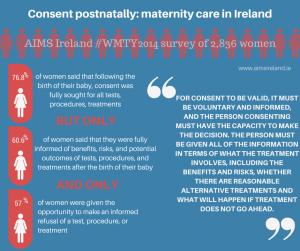 AIMSI would recommend that the issue of consent and provision of unbiased, complete information become areas of importance with Irish maternity units. “Hospital Policy” should not over-ride or give illusion of consent and individual choice for care options, admission, and opting in or out of procedures, tests and treatments. Consent policies should be revisited and printed material become available for every woman booking into maternity units. Women should be informed of all the benefits, risks, and potential implications for themselves and their baby to have or not have procedures, tests, treatments, and interventions in order to make the best decisions in their circumstances. Women cannot truly give consent unless they understand what it is they are consenting to and are supported in these decisions by health care providers. AIMS Ireland recommend strongly that a National clinical guideline is implemented to support the principals of informed decision making in Irish maternity services. To facilitate guidance of this, obstetric units should be under obligation to implement already existing National clinical guidelines for evidence based care rather than routine policy which relies heavily on medical management. Further, HSE must come in line with best practice Midwife : Woman ratios of 1:28 for low risk case loads and 1:25 for high risk case loads to ensure supportive and safe care for women and their babies. Current Midwife : Woman ratios in Ireland range from 1:30 to 1:55.